Kristie Cook spices up the popular subject of souls, romantic reincarnation, of love that spans lifetimes. 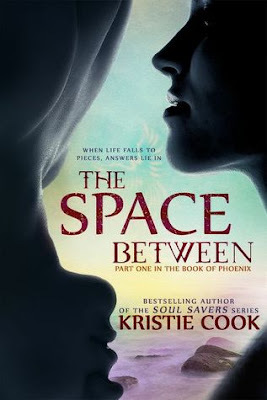 The first in her all new Book of Phoenix series, The Space Between, is another addition to the new adult genre that the world will embrace with willing arms. Leni's last day in Italy, when her dream of dancing on stage comes to a close, she comes face to face with Jeric Winters. Their meeting seems like fate but the connection is instant. When Jeric and Leni part ways they never expect to see each other again, especially not in Leni's hometown in Georgia. When life starts getting weird for them both they find that they only have each other, a locked journal, and mysterious tattoos. The Space Between is more contemporary romance with supernatural elements than an all out adventurous fantasy. Though the story takes readers back to the past, to show the connection between Leni and Jeric's past lives as Jacey and Micah, it didn't feel like the story took off until the last ten to fifteen chapters. Reincarnation can be a tricky storyline to get into more so when readers have to relive the same story twice. Even with tweaks and differences, it takes the edge off the excitement of the plot. I really had a hard time getting through Jacey and Micah's chapters, especially knowing that I was reading something completely similar to what I'd just read about Leni and Jeric or what would be coming. Despite the structure of the story, there are elements of characterization that spoke volumes about the uniqueness of Cook's writing style. Jeric and Leni have tough pasts, tragic and complex. Cook's characters have depth that shows in their actions as well as their thoughts and feelings. I loved that the most solid aspect of their connection was sign language. Jeric had to learn to sign because of hearing loss and Leni learned to better communicate with an older family member. It's not often that I get a chance to find a story like The Space Between that presents characters with physical challenges or some other aspect that's makes them more relatable as real, every-day people. Cook is an author that charms her readers with thoughtful plots and tantalizing characters. The Space Between is especially perfect for readers who strongly love stories about souls and reincarnation.